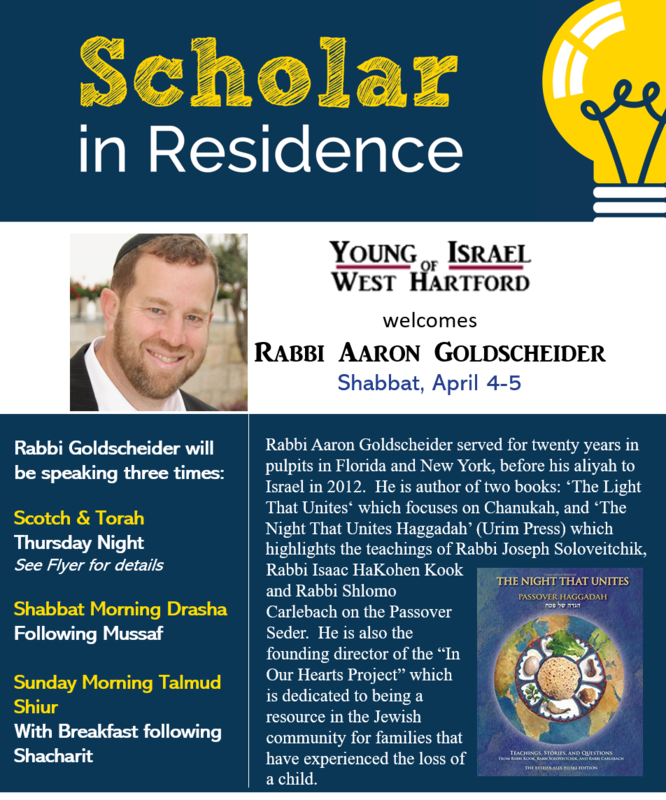 Rabbi Aaron Goldschedier served for twenty years in pulpits in Florida and New York, before his Aliyah to Israel in 2012. He is author of two books: 'The Light That Unites' which focuses on Chanukah, and 'The Night That Unites Haggadah' (Urim Press) which highlights the teachings of Rabbi Joseph Soloveitchik, Rabbi Isaac HaKohen Kook and Rabbi Shlomo Carlebach on the Passover Seder. He is also the founding director of the "In Our Hearts Project" which is dedicated to being a resource in the Jewish community for families that have experienced the loss of a child. A member of the National Council of Young Israel and the Union of Orthodox Jewish Congregations of America. Nationally affiliated with the National Jewish Outreach Program, and National Conference of Synagogue Youth. Locally affiliated with the Kashrut Commission of Greater Hartford, Eruv of West Hartford, and Mikveh Bess Israel of Greater Hartford. Site hosted by ShulCloud, © 2019 All rights reserved.